FILE - A coast guard walks past a ship docked at the Red Sea port of Hodeida, Yemen, Jan. 5, 2019. The United Nations Security Council is due to vote Wednesday to approve the deployment of up to 75 observers to Yemen's port city of Hodeida for six months to monitor a cease-fire and redeployment of forces by the warring parties, diplomats said. After a week of U.N.-sponsored peace talks in Sweden last month, the Iranian-aligned Houthi group and Saudi-backed Yemen government foes reached the deal on Hodeida, the entry point for most of Yemen's commercial goods and aid supplies, and a lifeline for millions of Yemenis on the verge of starvation. The 15-member Security Council last month authorized an advance monitoring team led by retired Dutch General Patrick Cammaert and asked U.N. Secretary-General Antonio Guterres to recommend a larger operation. FILE - U.N. Secretary-General Antonio Guterres addresses delegates during the opening session of a U.N. Migration Conference in Marrakech, Morocco, Dec.10, 2018. The council will vote Wednesday on a British-drafted resolution that asks Guterres to "expeditiously" deploy his recommended larger operation, which will be known as the United Nations Mission to support the Hodeida Agreement (UNMHA). The draft resolution also "requests Member States, particularly neighboring States, to support the United Nations as required for the implementation of UNMHA's mandate." A Security Council resolution needs nine votes in favor and no vetoes by Britain, the United States, Russia, France or China to pass. Diplomats said the Yemen draft is expected to be adopted. In his Dec. 31 proposal to the council, seen by Reuters, Guterres described the proposed 75-strong team as "a nimble presence" to monitor compliance of the deal and establish and assess facts and conditions on the ground. "Appropriate resources and assets will also be required to ensure the safety and security of U.N. personnel, including armored vehicles, communications infrastructure, aircraft and appropriate medical support," Guterres wrote. "Such resources will be a prerequisite for the effective launch and sustainment of the proposed mission," he said. 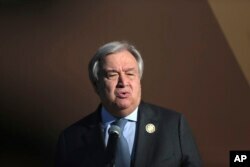 Guterres said the larger monitoring mission would contribute to sustaining a "fragile political process" relaunched by U.N. Yemen envoy Martin Griffiths. Griffiths is aiming to convene another round of talks between the warring parties this month.